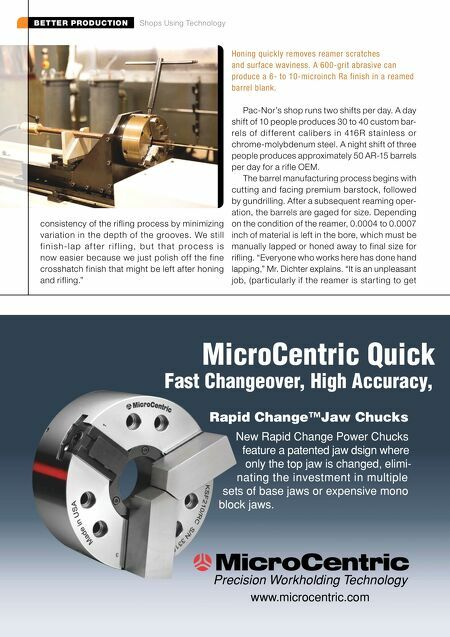 BETTER PRODUCTION Shops Using Technology Precision Workholding Technology www.microcentric.com New Rapid Change Power Chucks feature a patented jaw dsign where only the top jaw is changed, elimi- nating the investment in multiple sets of base jaws or expensive mono block jaws. 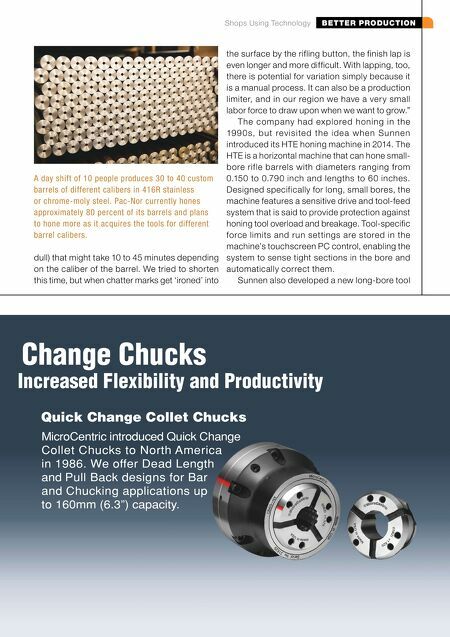 Rapid Change™Jaw Chucks Fast Changeover, High Accuracy, MicroCentric Quick consistency of the rifling process by minimizing variation in the depth of the grooves. We still f i n i s h - l a p a f te r r i f l i n g , b u t t h a t p r o c e s s i s now easier because we just polish off the fine crosshatch finish that might be left after honing and rifling." Pac-Nor's shop runs two shifts per day. A day shift of 10 people produces 30 to 40 custom bar- rels of dif ferent calibers in 416R stainless or chrome-molybdenum steel. A night shift of three people produces approximately 50 AR-15 barrels per day for a rifle OEM. The barrel manufacturing process begins with cutting and facing premium barstock, followed by gundrilling. After a subsequent reaming oper- ation, the barrels are gaged for size. Depending on the condition of the reamer, 0.0004 to 0.0007 inch of material is left in the bore, which must be manually lapped or honed away to final size for rifling. "Everyone who works here has done hand lapping," Mr. Dichter explains. "It is an unpleasant job, (particularly if the reamer is starting to get Honing quickly removes reamer scratches and surface waviness. A 600-grit abrasive can produce a 6- to 10-microinch Ra finish in a reamed barrel blank.